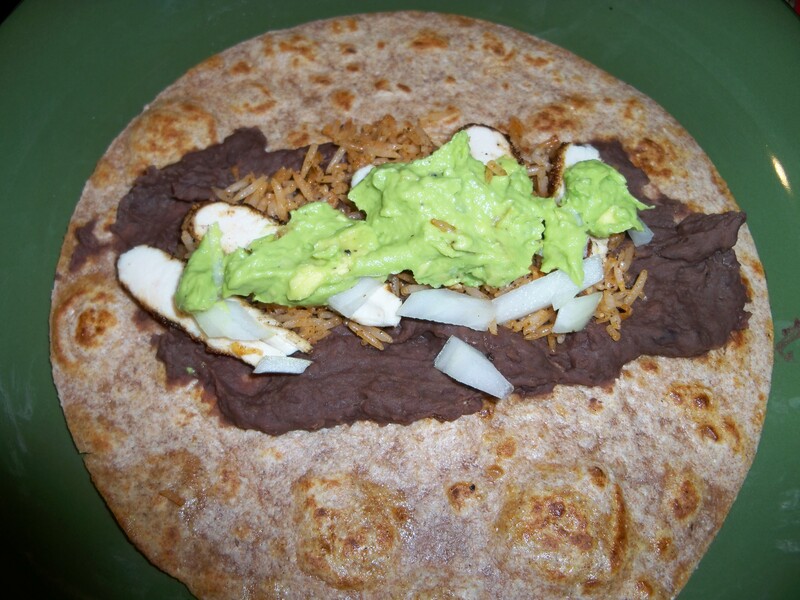 If you are looking to make a delicious dinner under five dollars you can make these amazing chicken, avocado burritos with black beans and rice. They are quick, healthy and easy on your wallet. They can be made with or without chicken. Making them vegetarian just cuts the cost even further. We also enjoy these with or without tofu. Cook up your brown rice. We like to do this in advance to make burrito making fast. You can cook it fresh or ahead of time. We use a rice cooker but it can also be prepared on the stove. We get a large bag for $1 and you are using about .25 cents worth for the meal for four. The black beans we picked up a Trader Joe’s and they were under $1, we also get the Whole Foods branded ones for a few cents over $1. The tortillas we pick up were the Trader Joe’s brand. We also get the Whole Foods Branded for under $1.50 for a bag of 8 -12 large. We use 4 tenderloin breasts and chop them up which run .25 per tenderloin. We use (4) at .25 cents each equaling $1 in chicken, and the rest of the budge is in the sea salt and pepper and onion. If you don’t have the tenderloins you only need 1 breast which you can find for under $2. You can also opt for tofu which runs $1 for a container of organic firm. If you omit the chicken or tofu you can get your burrito cost down to $4 for four. That gives you 8 large burritos and we usually have extra to make leftovers. Its a wonderfully affordable meal that the whole family can enjoy. The kids really love making these and getting involved with their food. This recipe keeps dinner simple and healthy. Once your rice is done cooking or is pulled out you want to open your beans and heat them in a pot. We like to warm the tortilla in a pan but it is optional. Take a tortilla fill with beans and rice. Then top with chicken, pureed or mashed avocado and onion. We like our burrito a little spicy so we add some cayenne pepper to the rice as it cooks which is optional depending on if you like it spicy or not. This is so quick and easy and always a delicious and nutritious meal. Previous Post Amazing Health Benefits of Avocados – Eat an Avocado Today! Hello there, just become aware of your weblog thru Google, and found that it’s really informative. I am going to watch out for brussels. I will appreciate in case you continue this in future. Lots of other folks will likely be benefited out of your writing. Cheers!